I have a number of regular venues I fish, many of them I have become really fond of over the years. I’m still open to giving new places a go though, in fact that’s how most of my favourites became that, because I fished them in the first place! Unless we try somewhere new our horizons will never broadened. With a large expanse of water on my radar for a while, now was the time to try it before summer drifted. Mind you, it was nothing like that when I arrived. Heavy rain meant I was soaked, along with all my gear, as I set up. The cool day certainly had an autumnal feel to it. There for two nights, I had a scout around first before setting up. The venue isn’t a gravel pit, in fact it’s a huge reservoir, and as such I wasn’t expecting that much in terms of features. Five feet in the margin dropping off gradually to twelve feet at five rod lengths out. And that’s where I put one bait with the other at three lengths. The bottom was totally clear and weed-free. I know all that because I spent time prior to fishing getting to know the swim. A lot of anglers just cast out blind or perhaps take others’ word for what’s beneath the surface. ‘It’s 30 feet deep in the middle’ was the oft-quoted statement about one particular lake I fished in the 90’s. But I actually spent an afternoon on there with a marker float and the deepest was twelve feet – in the marginal drop-off. You can see my marker float set-up in the photo above and in more detail in the one below. I don’t have a special marker-float rod or reel, they’re just old carp gear. I threaded on a 2.5oz lead, two beads and away I went. Knowing what’s in front of you gives you greater confidence than a chuck-it-and-chance-it approach. It doesn’t matter what I’m fishing for, or where, I always cast to a spot for a reason. With the weather being what it was I could have been forgiven for skipping marker float duties. But I wasn’t looking for forgiveness, just what was in front of me. By the time I had put out some particles though, with redfish groundbait as the carrier, and then cast the rods, I was happy to retire to my shelter. I had a couple of hours before one of my bite alarms went off on a prolonged scream. Had I hooked a carp? 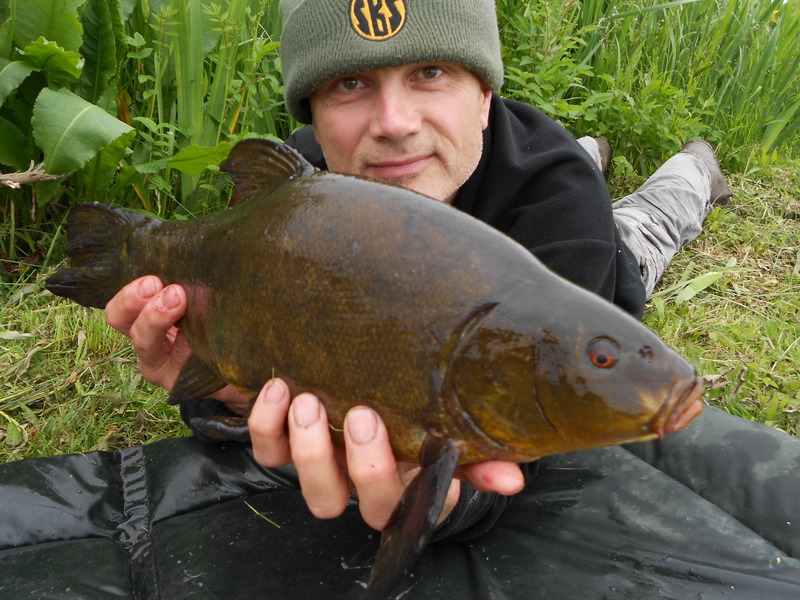 Even to the point of seeing the fish for the first time I was unsure whether it was a big tench or a small carp. I was more than happy though to eventually discover that it was the former. In the net just in time for the rain to hold off so I could take a photograph. Talking of broadening my horizons on venue, I was also doing the same on bait. I was trying something new, as opposed to my tench favourites, the corn-shaped poppers. 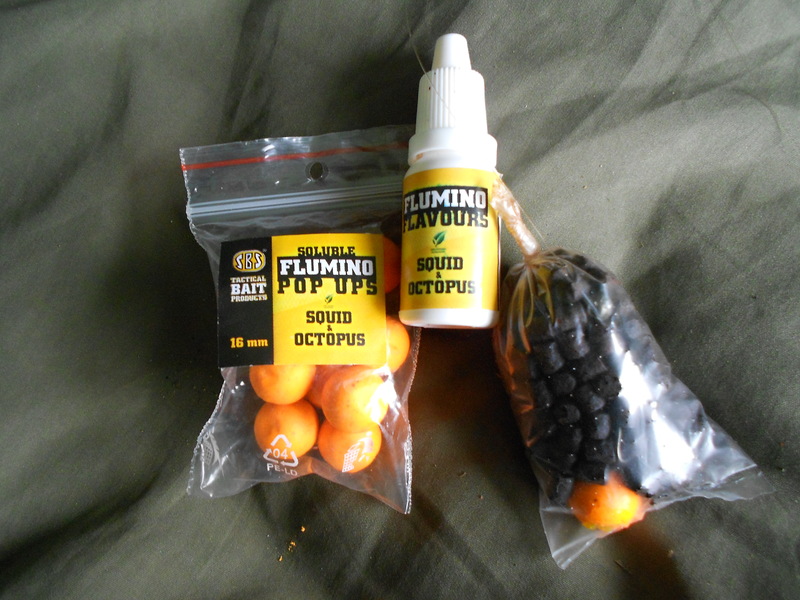 I was fishing with a 16mm squid and octopus pop-up. 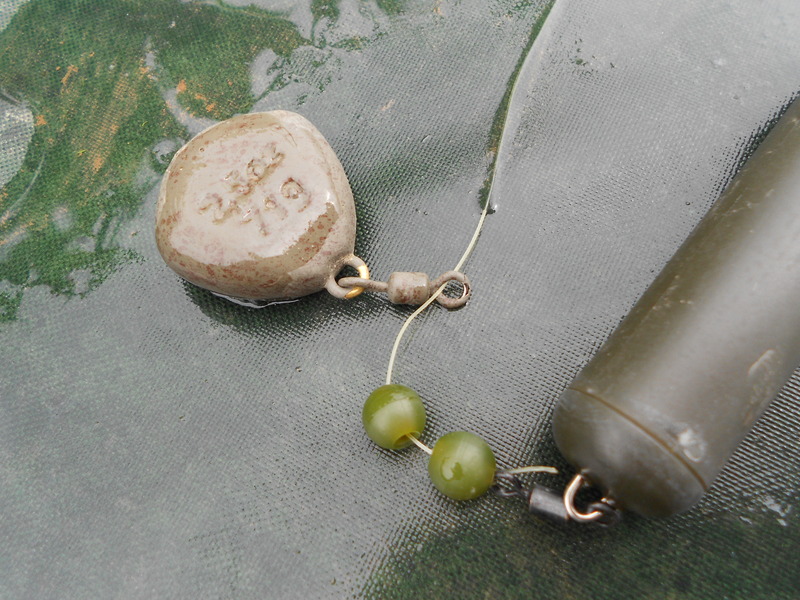 What was slightly different about this one though is that it was a soluble boilie. I’ve been wanting to give them a go for a while, and encouraged to do so by SBS’ Daniel Novak, I took the plunge and so had a few packs as part of the Flumino range I had in with my most recent order. The boilie, as its name suggests, begins to break down in the water thus emitting an enticing leak around it. There is also a flavour enhancer in the Flumino pack and I smeared a couple of drops of that on as well. It did the trick! I was certainly happy to get a fish on the bank so early on fishing a brand-new venue. One incidentally that I had no knowledge of whatsoever. 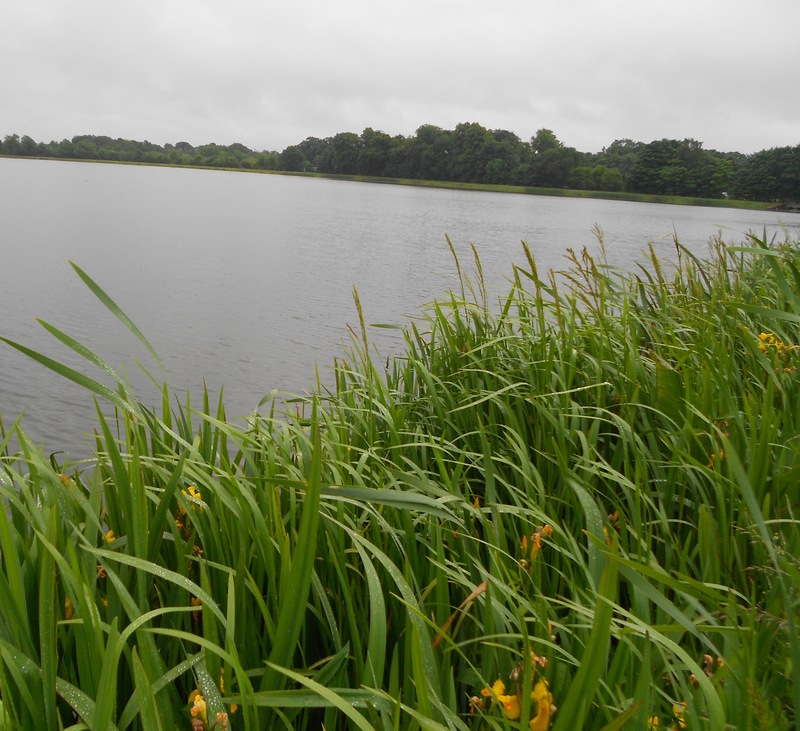 It’s generally known as a carp venue, and I may be fishing it for them in the future, so watch this space. But like so many it will also contain specimens of other species. And that was my intention, to test the tench potential. First impressions were good. Very good! As darkness drew in I cast out both rods and switched the soluble boilie for a conventional 16mm lobworm pop-up. I didn’t know how long the night would be, and I didn’t want to get up in the middle of it just to change a boilie, although it doesn’t break down totally. 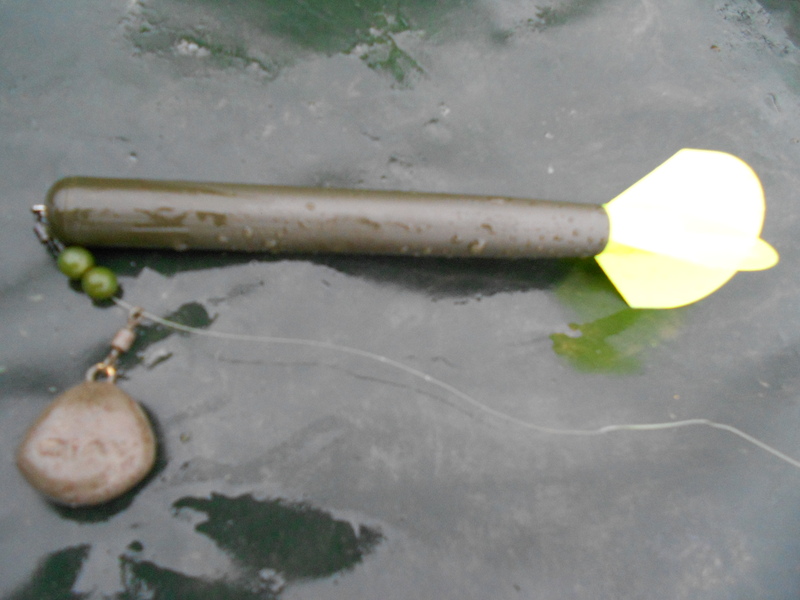 As it happened, I was anyway, as the left rod which was three lengths out, went off at 1.45am. 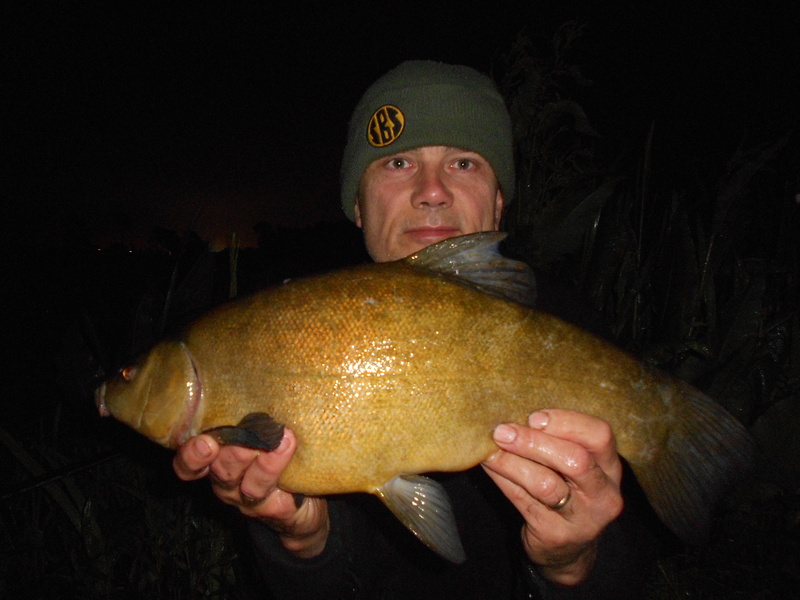 A tench had taken a fancy to the 2x 12mm M2 pop-ups. Again though, I didn’t know whether it was a tench or a carp until I saw it. Less than 12 hours into my session, I liked what I saw regarding the new venue. However, my next two takes brought me back to reality. Firstly I had an early morning bite-off on the lobworm pop-up, for which a pike became the number one culprit. Then, back to the squid and octopus, I had a hook-pull. By now we were well into the new day but the weather was still the same. Then around lunchtime, with some brighter weather putting in a brief appearance, I had another run on the M2 rod. As always, when you have just lost a couple of fish, you do find yourself being a little more gentle with whatever’s on the other end. I was more than pleased when I broke the pattern and netted the tench. 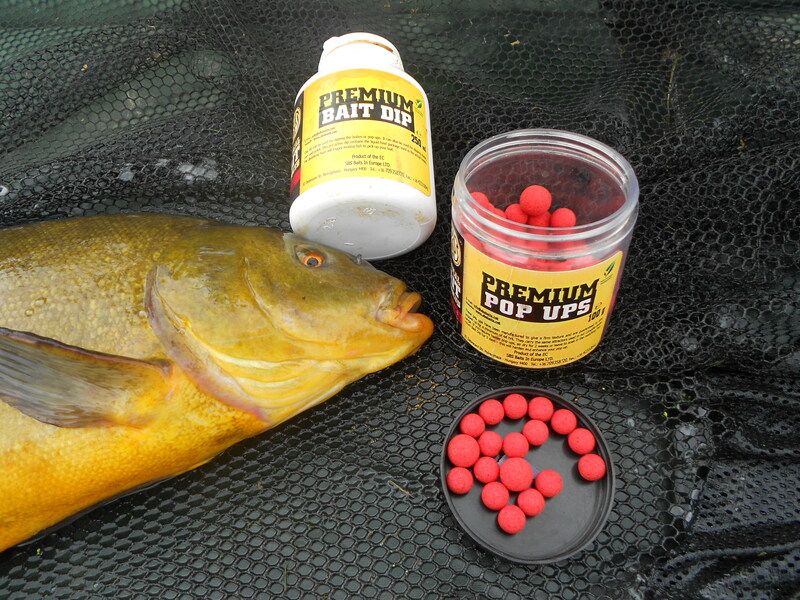 That’s it below, with the Premium range of M2 bait and dip. 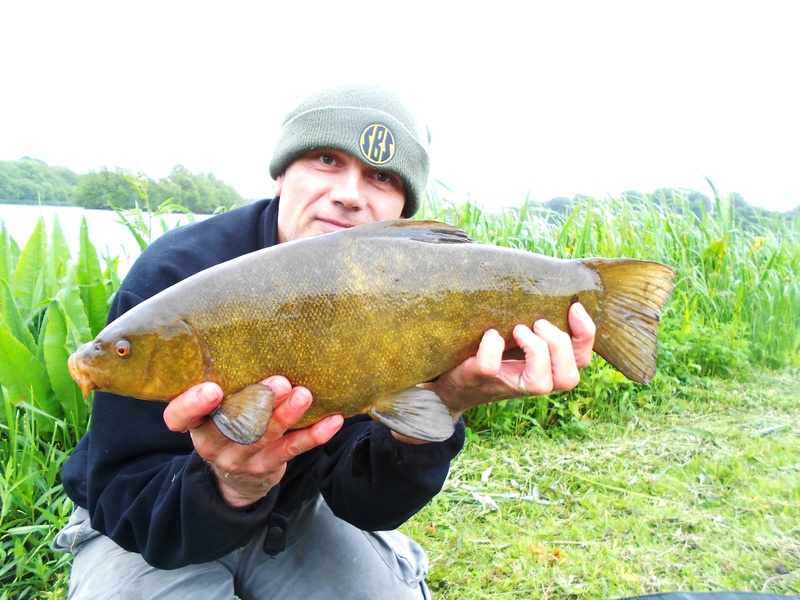 The next tench, which was number four, also fell to the M2 baits. Caught at 4.15pm the conditions were breezy and overcast. Prior to the fish I had been for a brief walk around part of the venue with my marker float rod. Being as I had the place to myself I thought I’d go and explore a few likely looking swims with future visits in mind. And not just for tench and carp either. One corner looked very ‘perchy’ so I wanted to check depth and weed growth. 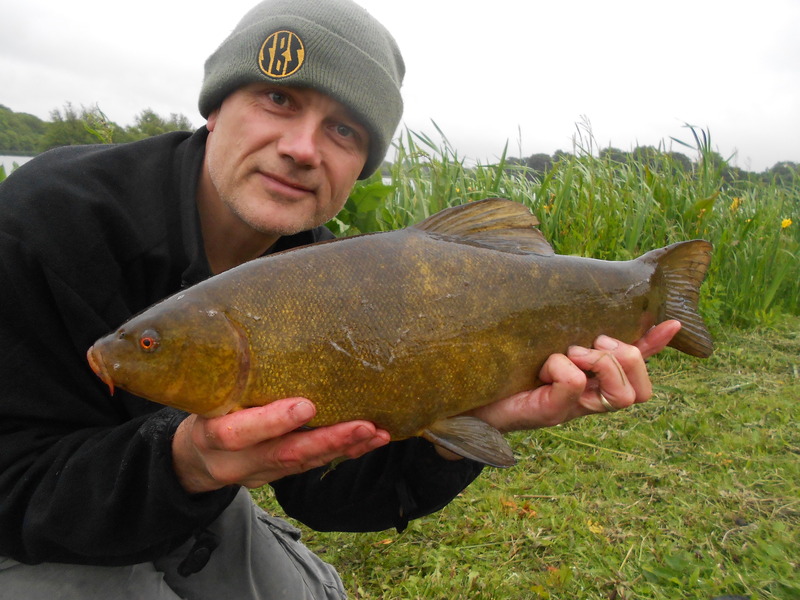 Tench number five came an hour later. It was a good one and I was trying to get a photo of it being returned. But juggling a camera in one hand and a slimy fish in the other doesn’t always work. It slipped through my hand and on to premature freedom. Never mind, I was reaching saturation point with fish photographs anyway, hence the desire get a different shot.